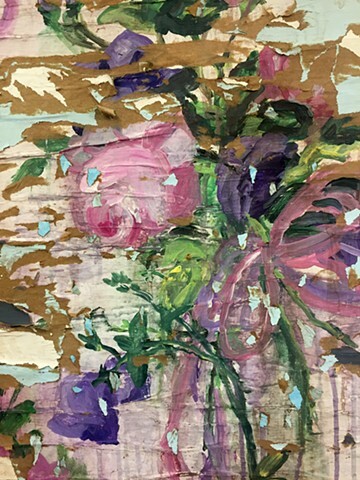 This work is based on the wallpaper on my mothers side of the bedroom when I was a child that was eventually stripped and repainted to be powder blue. I pasted layers of painted paper to the gallery wall and then peeled them back as if rediscovering the original wallpaper. It is a meditation on memory, space and personal history that captures the vanishing memories of my childhood and anxiety about my mothers aging, translating feelings of remembrance and loss into extant reality.